Time travel, long imagined by writers and dreamers, is not as far-fetched as you might believe. Sure, it seems fantastical and improbable — the imaginings of which are only meant for postulations and movies — but astrophysicists do it all the time. 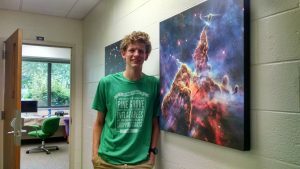 And so did Hope College freshman Jeff Engle in the summer of 2016 at NASA’s Goddard Space Flight Center in Greenbelt, Maryland. All it took was expensive, highly powered, one-of-a-kind stellar equipment called the Fermi Gamma-Ray Space Telescope. That and funding and guidance from the Hope College physics department and Professor Dr. Peter Gonthier. 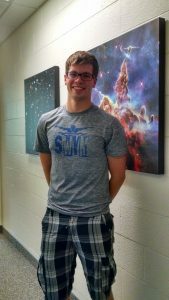 This research is made possible by the generous support of the Department of Physics and the Dean for Natural and Applied Sciences Office of Hope College. Since the launch of NASA’s Fermi Gamma-ray Space Telescope (Fermi), its Large Area Telescope (LAT) has detected over 200 new γ-ray pulsars. For most of these, γ-ray light curves have been obtained containing information on the emission geometry, the particle acceleration mechanism, and its location within the magnetosphere. In addition, radio astronomers have obtained radio light curves from the radio-loud Fermi pulsars, which are synchronized in time with the γ-ray light curves. Such data of observed radio and γ-ray light curves of normal and millisecond pulsars can be compared with those predicted from a hybrid model that assumes force-free electrodynamics within the light cylinder and a dissipative regime outside (FIDO) as well as empirical radio beam geometry and luminosity models. Such fits serve to constrain the viewing geometry of the pulsar by restricting the angle of the observer and the magnetic inclination angle with respect to the rotation axis. In this way the flux correction factor can be determined, enabling the estimation of the radio and γ-ray fluxes. This research will be useful in further testing of this theoretical high-energy emission model and improving our understanding of where and how the acceleration of charge is taking place in the pulsar magnetosphere. 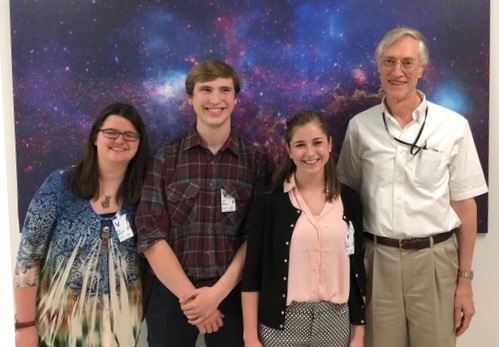 This research was supported by an award to Hope College from the Howard Hughes Medical Institute through the Undergraduate Science Education Program and by an undergraduate fellowship from the Michigan Space Grant Consortium. We are developing compact, analytical expressions of the cyclotron total spin-dependent widths, or lifetimes, of excited Landau states. These widths are required in our recent Compton scattering developments for strong-field magnetar magnetospheres. We begin with the analytics for the spin-dependent widths presented in Sina (1996), which has been our source for the development of Compton scattering, and establish equivalency with the differential widths developed by Latal (1986). Both approaches implement correct Sokolov & Ternov wave functions. From here, we make further improvements to develop an integral for the total differential widths with the integration variable only present in the square of the associated Laguerre functions. With the use of several series representations, we obtain an integral in the form previously used in our efforts. The result is an expression that includes Legendre functions of the second kind with an argument >1, for which we seek an algorithm for efficient evaluation. Exploring two possibilities, recursion relations, and hypergeometric functions, we find that the former breaks down for large values of the magnetic field (B) and the initial Landau state (n) due to the argument being >1. Taking the hypergeometric approach, we achieved numerical values that agree with Latal (1986) and Sina (1996) results for small n and B, but the analytics break down for large n and B. This problem encourages the development of asymptotic approaches similar to those developed in the past but for spin-averaged widths. These processes will be applied to future work. This work is made possible by the generous support of the National Science Foundation (Grant No. AST-1009731), the NASA Astrophysics Theory and Fundamental Program (NNX13AO12G / 12-ATP12-0169), the American Physical Society, and the Michigan Space Grant Consortium.